Hawthorn (Crataegus spp.) is the “hope and faith that everything will be ok” plant. A tall shrub in the rose family, hawthorn grows in open meadows, on roadsides, along streams and forest edges at low to mid elevations. In my area, the conservation district people planted scores of hawthorn trees in wet areas. They’ve since replaced hawthorn with more effective plants, but us regular folk get to reap the benefits of the abundance of hawthorn. While the flowers are prized in spring, in fall we harvest the leaves and berries. The berries, leaves and flowers contain high quantities of flavonoid glycosides. Flavonoids in plants aid in the reduction of abnormal cells in the body by killing the free radicals which cause the abnormalities. 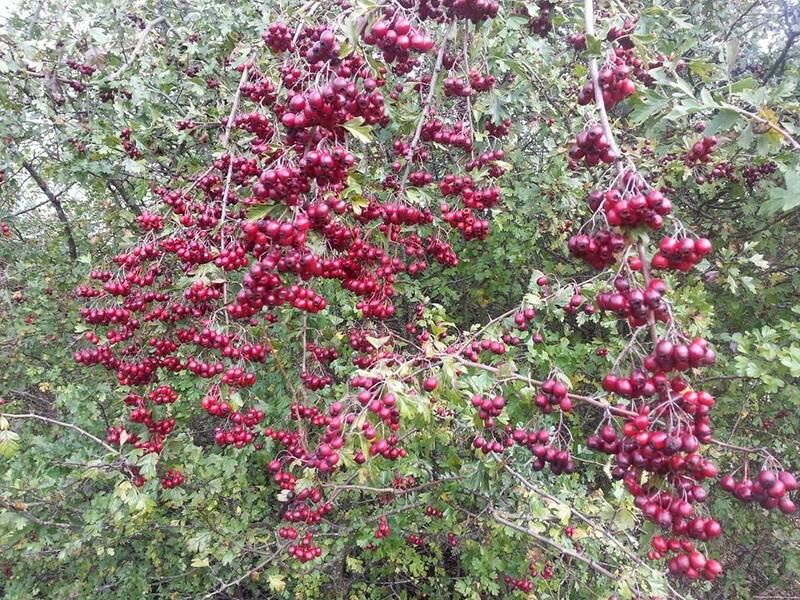 The flavonoid glycosides in hawthorn aid in treating disorders of the heart such as angina, stroke, hypertension, and palpitations. Think of it this way: when road construction crews on an interstate close lanes to funnel traffic away from the construction area, the same amount of traffic must flow through fewer lanes. This causes backups, traffic jams, accidents, and shenanigans. When all lanes are opened with fresh new pavement, the traffic flows well and everyone is happy. The flavonoids in hawthorn act to dilate the blood vessels and increase the blood flow to the heart muscle and through the pathways, which leads to a reduction in the peripheral resistance. Hawthorn can be taken regularly to repair and strengthen the heart tissue and normalize function. Side effects are limited to none for most people. Good stuff! Incidentally, as hawthorn strengthens the structure of the coronary system, with long term usage it can aid in the reduction of hemorrhoids and varicose veins. The flavonoids in hawthorn are helpful for stomach disorders including stomach spasms, stomach acid deficiency, preventing stomach irritation and ulcers. They are also used for helping with diarrhea, constipation, gallstones, gallbladder ailments, lower urinary tract and kidney disorders, fluid retention (edema), gout, back and leg pain (sciatica), diabetes, high cholesterol, high blood pressure, fever, increasing immune function during exhaustion, increasing blood flow in the limbs, increasing urine flow and quenching thirst. Hawthorn is valued in treating anxiety and panic attacks, in addition to relieving the physical and emotional effects of stress and insomnia as it has a strong relaxing effect on the central nervous system. This is particularly helpful for those who are going through life transitions and dealing with grief. It can be taken daily as a nerve tonic, or as needed during stressful times. Take note: Some people feel a “swaddling” effect with hawthorn. For most, this is a comforting feeling. For others, it can feel claustrophobic on occasion. Consider ashwagandha as an effective substitute for anxiety issues. Hawthorn contains tannins, which makes it effective in the treatment of digestive problems such as diarrhea and dysentery. It boosts the appetite and aids in the removal of stagnant of food in the digestive tract. Hawthorn can be very helpful for couch potatoes, those with mobility issues, in wheelchairs and/or bedridden. 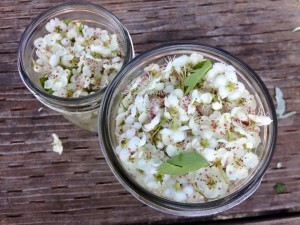 Harvesting hawthorn: In the spring, harvest the flowers that have pink tipped anthers. These flowers have not yet been pollinated. When the flowers are pollinated, they lose their medicinal value, as their focus is then on making the seeds, not on being attractive to the pollinators. Once the hawthorn flowers are pollinated, the tips of the anthers turn dark. 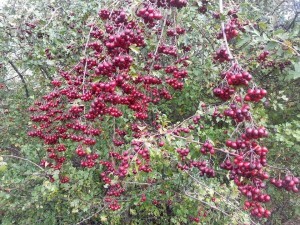 In autumn, harvest the berries once they are deep red. People tend to get excited about hawthorn and harvest the berries too early, before the medicine is fully developed. Patience Grasshopper! Hawthorn berry medicine is well worth the wait. 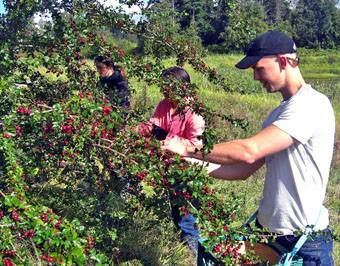 Just make sure to harvest hawthorn berries before a hard frost, as they become mushy quickly afterward. As you know, bioflavonoids and Vitamin C complex are destroyed with heat and drying, so it’s a good idea to pay attention to the medicines you will make that help to preserve this immune system helper. Using fresh flowers, leaves and berries (seasonally driven), you can make an elixir, straight up honey, oxymels, and vinegar. The flowers are so delicate as to not need any chopping, however, mince the leaves when processing them. To utilize the berries, gently break open them open without breaking the seeds. Use a Foley Mill or put them in a bowl and roll the bottom of a canning jar on them to break them open. Making remedies with whole unbroken berries will be weak at best. The menstruum, whether alcohol, honey, vinegar or water, needs to have access to the alkaloids and nutrients inside the berries. As hawthorn is in the rose family, the berries contain a lot of pectin. I never fill my jar more than halfway with the broken berries. The pectin will inhibit the menstruum from accessing the medicine in the berries if packed too tightly by acting as a barrier. Not cool! Again, fill the jars only halfway with broken berries and top off the jars with the menstruum. As always I leave you Wild About Plants! For more info about Cedar Mountain Herb School and wildcrafting, please visit my website at www.cedarmountainherbs.com.